Sauerbraten My Way requires 2 to 3 days marinating time, so plan accordingly. Combine the wine, vinegar, chopped onion, garlic, thyme sprigs, bay leaves, peppercorns and cloves in a bowl or mixing cup. Place the meat in a zip top bag and pour the marinade over, making sure some is on both sides of the meat. Zip the top and refrigerate for 2 - 3 days, turning occasionally. After 2 - 3 days, heat the oven to 325°F. Remove the meat from the marinade, scraping off any parts that cling. Pat the meat dry and season with salt, freshly ground pepper and thyme leaves. Strain the marinade, keeping the solids and marinade separate. For now remove the bay leaves and thyme sprigs. We will return those once we have browned the onions. Heat a large Dutch oven over medium high heat; add the olive oil, then add the meat and brown well on both sides - about 10 to 12 minutes. Remove the meat to a plate. Add the carrots and reserved solids from the marinade to the pot and cook, stirring often, until the onions just begin to brown. Sprinkle in the flour and cook for about 2 minutes. Stir in the marinade along with the beef broth and reserved herbs; bring to a simmer. 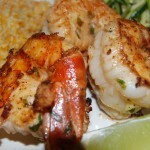 Return the meat to the pot; cover and place the pot into the oven for 2 1/2 to 3 hours or until it is extremely tender. Remove the meat to a plate. Strain the broth to remove all solids, pressing with a wooden spoon to get as much of the solids as you can. Bring to a simmer; add a bit more stock if it seems too thick, taste and adjust for seasonings. Slice the meat against the grain and serve with the gravy. Garnish with chopped parsley if desired. Wine Recommendation: With the deep rich flavors of this wine braised beef dish, any full bodied red wine will pair wonderfully. Cabernet, Merlot, Red Burgundy, Zinfandel. Just make it deep and red. As Frank Sinatra would say … ” I did it my way”. As my Aunt Christina would say … “That’s not Sauerbraten in the traditional sense”. 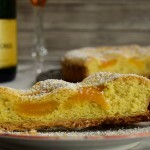 As I say … “I’m the cook, it’s my traditional way”. Wine, whine or …I like the flavor of wine better than that of vinegar, so I use more wine in my recipe then most would have you use. 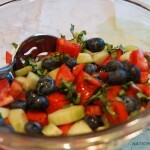 I don’t like the flavor of Juniper berries, so I don’t add them to the marinade. And I’m not a big fan of using cookies to thicken a sauce. So I don’t do that either. But what I do do is make a darn fine tasting Sauerbraten. I have been eating sauerbraten in my family home for years and years. Once I ordered it in a German restaurant and I didn’t like it so much. I just figured it was not a good sauerbraten. Then I did it again, at another German restaurant. And I still didn’t like it. So I checked out some recipes. Well, oh my. What a difference they made. More vinegar then I had ever seen my mother to use…hardly any vinegar is what my mother used. Juniper berries? Well, my mom always said she and gin didn’t agree because of juniper berries…so she never used those. And ginger snaps? Who thought of thickening a sauce with cookies? Not my mom. So I guess, Sauerbraten My Way, could also be called…Sauerbraten My Mother’s Way. And my mother’s way is my way. Let’s start with the marinade. Because the meat is going to be flavored deeply with the wine and vinegar, make sure you use good wine and a good red wine vinegar. The meat itself can really be any kind of roast you choose, from a bottom round to a chuck steak. This time I used a chuck steak. Make sure the meat has some marbling in it so it will cook up moist and tender. Mix all the marinade ingredients together then pour it over the meat in a zip top bag, remove any air and seal. 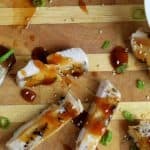 This is my favorite way to marinate things as it ensures the meat is completely surrounded by the marinade. Even with it in its zip top bag, I put the bag inside a container just on that off chance it springs a leak. I would rather have the wine leak into a bowl then into my refrigerator! Although it might not be entirely necessary, since the meat is surrounded by the marinade anyway, I still turn it twice a day, just to be sure every part is getting its fair share. After the meat has been soaking up the winey goodness for at least 2 but better if it’s 3 days, remove it from the marinade; making sure to scrape off any clinging onions and such, and pat it dry. You know, dry meat browns, wet meat steams. Season with salt and freshly ground pepper, then sprinkle on some dried thyme. Now, brown it well in a Dutch oven or large heavy pot. Take your time with the browning process, as this will ensure a great rich gravy. Have you ever used one of those screens that’s intended to keep the splatter down so your stove stays clean? Well, I don’t think they work very well, as my stove still gets its fair share of splatter…I think the whole purpose of the splatter guard is negated when you have to lift it to turn the meat, all the splatter is just waiting for that moment to come flying out of the pan onto the stove. Yes, cooking can be a dirty endeavor. Once the meat has browned, remove it from the pan to a plate. Strain the solids from the wine/vinegar mix reserving both. Add the solids, along with some chopped carrot, to the now empty pot and brown them for about 5 minutes, or until the onions are tender and just beginning to brown; then add the flour and cook for about 3 minutes. The flour is going to thicken the gravy so we won’t need to add cookies later. Stir the marinade into the pot along with 2 cups of beef broth, return the roast and all of the juices accumulated on the plate, cover, and put into the 325º oven and ignore it for 2 1/2 to 3 hours, or until it is tender, tender, tender. Once it is tender, remove the meat and set it aside while we finish our gravy. We want to strain the solids through a sieve, keeping just the delicious sauce. Use a wooden spoon or rubber spatula to press against the solids to get as much flavor and liquid into the gravy, but leaving the pieces of onion and carrot, as well as the peppercorns and cloves in the sieve. If your sauce seems too thick, add a bit of beef broth to it until you have the consistency you desire. Conversely, if the sauce seems to thin, mix a little cornstarch with some beef broth and slowly add that until it thickens to your desired consistency. 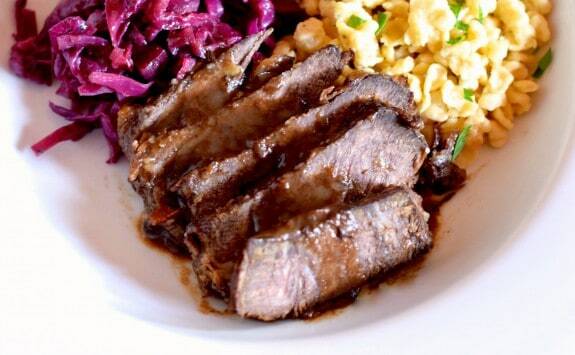 Sauerbraten is traditionally served with Spatzle and Braised Red Cabbage. So yummy. And see, I can be traditional when I want to be. 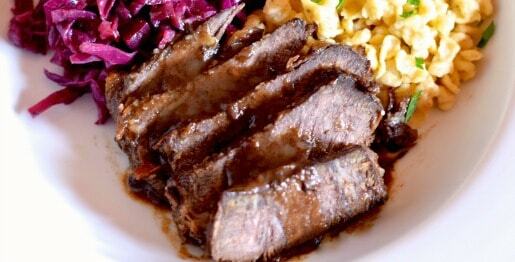 Sauerbraten My Way – perfect for a Sunday night dinner. Great dish. I am not a fan of ‘hot lettuce” but this was tremendous. Really roasted and carmelized. Based on 5 ounces of meat and 1/4 cup gravy -- and is the best I can do, but may not be 100% accurate.